The AX-8M is an Audio only master station and can be one of the up to 8 masters supported in the AX Integrated Audio & Video Security system. Each AX-8M master station can initiate and answer calls from up to 7 additional master stations and up to 8 door or sub stations. The master can be expanded with AX-16SW add-on selectors for a maximum capacity of 120 door / sub stations. Its streamline design is mountable on a wall or desk. When a door or sub station calls, a tremolo tone rings. To answer the call, simply press the TALK button once and speak hands-free, or Press and Hold the TALK button to use as push-to-talk, release-to-listen. If access control is included, simply press the “key” button and the associated electric strike or magnetic lock will be activated. 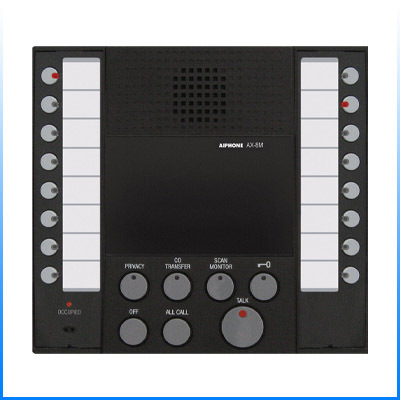 The AX-8M can answer the call from any audio only or audio/video door/sub on the system.